they say — anymore. He would move to his right and run around his backhand, or just drive into one. And then? Berdych would hit winner into the open court on Nadal’s forehand side. 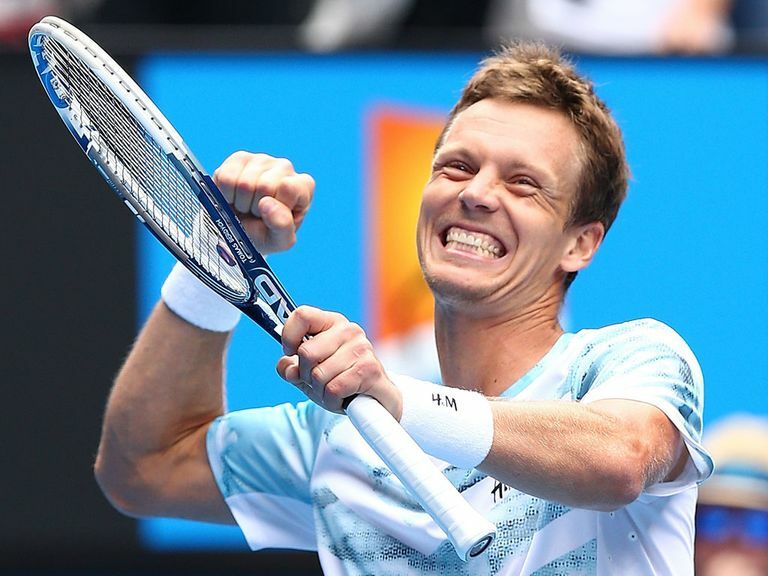 Berdych has a big forehand, but it’s not coming from a rifle. Nadal wasn’t even getting into the TV picture. There were glimpses of what was happening, though. Nadal was stuck and his legs couldn’t dig him out. I’d say he looked like a car with wheels spinning in the mud, but his wheels weren’t spinning. Nadal can still run fast when he gets going. But to lose that split second while stuck in the corner means he can’t cover the court the way he always has. Which meant he couldn’t get into his usual position. Which meant, for the first two sets anyway, he couldn’t get anything behind his shots. Which meant he wasn’t Nadal. I guess you can only run as fast as possible and slide 10 feet on asphalt so many times. Novak Djokovic is going to learn that soon, if he isn’t already. Berdych was oustanding, but it’s not that difficult to hit shots into an open court. What is the total of what Nadal has been through in the past year, anyway? A wrist problem, stem cell treatment on his back, more knee troubles and an appendicitis? Not to mention his back breaking down in the middle of last year’s Australian Open final. Nadal has always had injuries, followed by miracle recoveries. But the injuries are getting more frequent and more severe now. And against Tim Smyczek in the second round of the Australian, he started cramping all over his upper body. Against Berdych, it appeared to be his legs again. It’s going to be a miracle of timing for him to play seven best-of-five set matches to get through a major. Maybe it can still happen at the French, where his movement was so much better than everyone else’s that he can overcome a little loss of movement. The rest of the time, he’s going to have to adapt. End points quicker. Play closer to the baseline. I know how the score looks, but Nadal almost found a way to beat Berdych anyway. It show just how good he is that he can do that with a broken body. This is going to be the grinding phase of Nadal’s career. You cannot count on his body anymore. I just don’t know how much more he can do if he’s not Nadal. This entry was posted on Tuesday, January 27th, 2015 at 6:31 pm	and tagged with Australian Open, Rafael Nadal, Tomas Berdych and posted in Australian Open, Rafael Nadal, Tomas Berdych. You can follow any responses to this entry through the RSS 2.0 feed. put into words how I feel as his 81 years oldest fan.I enjoy what you write, you seem to read people so well. Lets hope that ” my Rafa ” will be around to give us the pleasure we all get when we watch him play. I will watch whenever he plays. Thanks so much for writing. No one has made me feel the buzz of tennis the way Rafa has. I was at his gold medal match at the Beijing Olympics – I’m pretty sure that’s the Olympics it was at — and will never forget how excited everyone got when he took the court and just energized the whole place the way he started out. It was like the Beatles had arrived or something. Usted Consigue Lo que Usted se Enfoca, pero recuerda, al principio puede ser dif. siendo poderoso, y que tan c.
Rafael Nadal not just Rusty. Body Broken | Greg Couch on Tennis <Liked it!